1 A small dagger made of bone with red/brown thonging wrapped around it for a handle. 2 The sand-colored shell of a large insect. 3 A set of leather saddlebags with two concealed pockets inside them. 4 A small air-dried skull necklace, at midnight any dead bodies within 100' of the wearer rise and shamble to stand around the wearer, they inflict no harm and the wearer may ask them 1 question per point of their charisma modifier (although the dead are under no compulsion to answer truthfully); once the questions have been asked or an hour has passed the dead disappear like a morning mist, returning to their graves. 5 A large coconut full of delicious juice. 6 A set of leather gloves, the palms have been textured to allow for superior grip. 7 A tiny orb of a metallic alloy unknown to your people. 8 A blood-stained set of manacles. 9 A spear made from petrified wood and the horn of some great beast. 10 A small pearl that always feels warm to the touch, locals call them Dragonpearls, they use them to keep warm during the cold evenings. 11 A leather pouch containing a handful of dried edible insects. 12 A water-skin that sounds like it has something thicker than water in it. 13 A small glass flask containing the hair of a desert dwelling creature, the hair absorbs light during the day and glows at night, if exposed to the sunlight during the day it will shed light equivalent to a lantern. 14 A set of wood and leather sandals that appear sized for a halfling or gnome. 15 A scroll that appears to chronicle the adventures of Zhataru an infamous thief of legend who vanished mysteriously. 16 3 strips of spicey jerky. 17 The withered, air-dried hand of a gnoll. 18 A lime-green paste made from mashing several species of beetle and mixing with a little water, when the sour paste is ingested it has a similar inebriating effect to alcohol. 19 An ancient world map that appears to show the land was once green and fertile. 20 A round stone with a hole in the middle of it, anyone looking through the stone perceives a red haze about anyone who has been poisoned. 21 A thick leather belt containing a number of pockets. 22 A dessicated spider wrapped up in a light gauzey cloth. 23 A leather pouch containing a handful of dried beetles, when crushed and added to saliva they make a bright blue pigment. 24 A child's doll made of twigs held together with thonging and scraps of fabric. 25 An unworking black gemstone, occasionally it makes the sound of a hammer striking an anvil. 26 A wooden wagon just big enough to fit a single person or a small amount of gear. 27 A potrait of man with fire for hair and smoke emerging from his mouth. 28 A shield made from the horned skull of a great desert dinosaur. 29 A small pinkish crystal attached to a piece of leather thonging, when it the presence of psionic (or magical depending on your campaign) energies the crystals grows warm. 30 A small glider built from the cured wing-skin of pteradon stretched over a wooden frame. 31 A face mask made from the tanned skin of an orc, wearing it gives the user the advantage on perception rolls in the dark. 32 A pipe made from the leg bone of an animal, when played it creates a high-pitched sound that carries for many leagues. 33 A portrait of a man sitting astride one of the Great Desert Worms, the portrait changes over time to resemble whoever possesses it. 34 3 stone coins with holes in the middle, they are tied together with thonging. 35 A set of chimes made from hollowed bones, when hung up on a leather thong they make a low whistling sound when the wind hits them right. 36 A juvenile specimen of the lands Great Worms, their flesh can be cooked and eaten, they also store large amounts of water in their bodies which can be drunk. 37 A climbing aid fashioned from the serrated spine of a desert eel. 38 A drum made from animal hide that creates a hollow, echoing sound when struck. 39 A shield fashioned from the shell of an extinct species of turtle. 40 A necklace of elf-ears. 41 A chunk of a strange green glass, occasionally dark patterns seem to swirl below it's surface. 42 A ring of dark blue stone, when worn it grants the bearer the ability to see clearly despite environmental impediments. 43 A bone sword that was a gift when you went through the rites of passage to become an adult in your home village. 44 A tiny slug-like creature, it occasionally emits small clouds of sweet smelling vapour. 45 A good luck charm made from the skulls and bones of three small corvids, tied together by leather thonging, each has a symbol painted on them, the symbols are life, death and fortune. 46 What appears to be a small dessicated finger, due to the state of it, it's difficult to tell the original species it came from. 47 A small stone idol depicting a nightmarish creature that appears be half-human and half-giant worm. 48 An ancient flint arrow head with a strange symbol drawn in chalk on it. 49 A lightly coloured robe that helps to reflect the harsh heat of the sun. 50 A piece of stone that someone has carved a portrait of a young man onto. 51 A large panel of glass that magnifies anything placed under it. 52 A glass vial containing the powdered remnants of what might once have been a potion. 53 A small glass vial of musk extracted from the scent gland of a desert skunk, if the musk is sprinkled on the PCs trial then it gives anyone attempting to track them by scent the disadvantage on their roll. 54 An ancient map of a legendary librarian believed to have sunk into the desert. 55 6 small chunks of a brittle wafer-like substance, each of which can sustain a man as though it were a days rations. 56 A club made out of wood studded with chunks of sharp black stone. 57 A map carved onto the back of a piece of hide, it seems to show to location of a hidden oasis, however there is what looks like a cloud of smoke and a skull etched beside it. 58 A dusty, twisted scale from a huge prehistoric lizard. 59 A clear gemstone that seems to reflect back an oddly distorted view of whoever looks into it. 60 A small bronze lamp that was reputed to have once contained a genie before it was freed by a foolish sultan. 61 A set of weapons fashioned from the claws of a desert lizard, they are fitting to leather straps designed to fasten over the wielders forearms. 62 A horn may from the twisted shell of a burrowing creature. 63 A blow-pipe with a prayer to the gods carved onto it. 64 The bright red feather of a giant bird. 65 An obsidian knife, when blood is drawn with it the fluid is absorbed by the blade. 66 A small bronze torc, engraved onto it is a scene depicting five people gathering around a moutain with lightning coming from the summit. 67 An enchanted waterskin that can hold double the amount of water that a normal skin can without adding any additional weight. 68 A stone box containing a single unfamiliar coin of a silver metal. 69 3 doses of a dull grey powder that flares brightly when fire touches it, it is mainly used to help start fires with damp wood. 70 A wooden whistle that immitates the roar of a T-Rex. 71 A jar of ointment made from animal fat and various herbs that protects from sunburn or frostbite when smeared on the skin. 72 A curved bone blade fashioned from a jaw-bone, it is designed for cutting fat from meat. 73 A set of stone divining tiles, used by shaman for foretelling the future. 74 The tail of a giant scorpion, it can be used as a shortsword and a vial of poison can be emptied into it prior to striking someone. 75 A long spear with a semi-circular bone blade at each end. 76 A ceremonial necklace made of desert shells given to those marked by fate. 77 A pouch containing dried brown grass that is smoked by the local tribes instead of tobacco; when smoked it gives of a pungent spicey aroma. 78 A long wooden pick used for teasing the marrow out of cracked bones. 79 A medium sized club made of stone with bone pines drilled through it. 80 A salted lizard on a stick. 81 A bone comb that is missing several of it's teeth. 82 A whip that appears to be made of braided human hair. 83 A set of colourful glass beads designed to be worn as hair ornamentation. 84 Two glass lenses, a piece of leather and some thonging that can be fastened to create a spyglass capable of seeing over long distances. 85 An old abacus with strange characters carved onto each of the wooden beads. 86 The picked-clean skeleton of a small mantis-man. 87 A bronze insignia of rank from some long-forgotten military force. 88 A small cactus plant, 2D6 needles can be extracted as used as ammunition for a blowpipe or makeshift caltrops. 89 The cracked shell of a large egg, traces of a pink yolk still clinging to the inside. 90 The deep violet tuber of a desert growing plant, rumoured to be useful as medicine. 91 A scrap of hide engraved with the first half of a nursery rhyme that you recall from your childhood. 92 A bone ear peg fashioned from the small tooth of a desert tiger. 93 A leather path with a stylised eye painted on it. 94 A wide-brimmed hat made from woven grasses. 95 A leather pouch with a board etched on one side, containing coloured pebbles used for a popular local game. 96 A small grey stone disk that grows darker in colour when within 100' of water. 97 A mirror made from polished stone, occasionally when it is used a demonic burning face can be seen staring back out of it. 98 A good luck charm made from the teeth of a giant lizard. 99 A flint knife that was given to you by the wise-person of your village. 100 A fist sized lump of purple crystal, when the person possessing it is reduced to 0HP they automatically stabilise and the crystal shatters becoming useless, when they awake they recall lingering near death and a figure in purple robes beckoning them back to the land of the living. 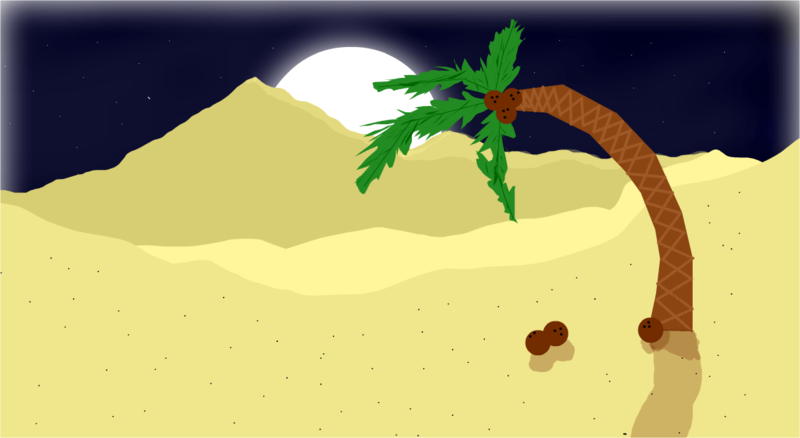 Desert Night drawing was created by Aaron Lathon and was taken from Sketchport, licensed under CC-BY. This entry was posted in Random Things and tagged adventure ideas, campaign idea, campaign ideas, Game Ideas, random ideas, Random things by John Large. Bookmark the permalink.